Falls at Elevated Work Sites | Miami Personal Injury Lawyer Gerson & Schwartz, P.A. Contact Florida Accident Attorney Gerson & Schwartz, P.A. Performing work at a site that is elevated is inherently dangerous. From scaffolds and ladders to roofs and skyscrapers, workers who fall from any height face a serious risk of severe injury. Often, the injuries caused by a fall take months to heal, and some types of injuries may cause permanent damage. When a worker is injured by a fall at a construction site, an experienced personal injury attorney can determine if that worker can file a lawsuit against a third party who may be responsible for the injury. Falls at a worksite can happen for many reasons. A worker may slip, trip on an object, or simply lose his or her balance. These falls can have a wide range of consequences, from broken bones and muscle strains to traumatic brain injuries, spinal injuries, and death. Generally, falls from higher elevations lead to much more severe injuries than those from lower heights. However, any type of fall can be dangerous, even those from as little as three feet. OSHA and Florida law require employers to help keep workers safe. They must actively work to keep their work sites free from any known hazards, and must train workers about any potential dangers that working on the job site may have. Workers must receive this instruction and training in a language that they understand. Employers must also provide safety equipment for workers at no cost to them. State and federal regulations require employers and the owners of a construction project to implement safety devices and procedures that can reduce the risk of falls. Handrails, guardrails, non-slip surfaces, and tethering equipment can all protect workers on the job. Workers can also take steps to protect themselves by clearing obstructions, using the safety equipment, and keeping the work area clean and free from clutter. No matter what safety precautions are in place, accidents can still happen. In some cases, faulty or defective equipment might cause a fall. For instance, if a lift or scaffold breaks, the manufacturer of that equipment may be responsible for paying damages to any workers who were hurt. In the same way, if any equipment or tools malfunction and cause the fall, the worker who is injured may have recourse against the manufacturer. While the workers’ compensation system does provide some financial aid to employees who were injured at work, it is often not enough to completely provide for the needs of the injured worker and his or her family. Unfortunately, in exchange for providing workers’ compensation benefits, most employees are barred from suing their employer for an injury sustained on the job. Fortunately, third-party lawsuits can help workers seek additional compensation like payments for pain and suffering, long-term care or rehabilitation, and/or lost wages or lost earning capacity. Third-party lawsuits are those filed against someone other than the employer. For example, a worker who fell from a construction site after a guardrail broke may be able to sue whoever created or supplied the equipment with the defective guardrail. In a successful personal injury lawsuit, the hurt worker will often receive much more compensation for his or her injuries than the worker would get from workers’ compensation. This additional money can be invaluable for employees who are unable to work after an injury for an extended period. Workers’ compensation often does not provide enough financial help for workers with severe injuries or those who need extended care or rehabilitation; a third-party lawsuit can help cover this gap. Third-party lawsuits could be filed against a party that negligently designs or constructs equipment used on the site, or against an outside party who comes into the site and causes an injury. For instance, a drunk driver who crashes into a bucket truck and causes the worker to fall could be the subject of a third-party lawsuit. 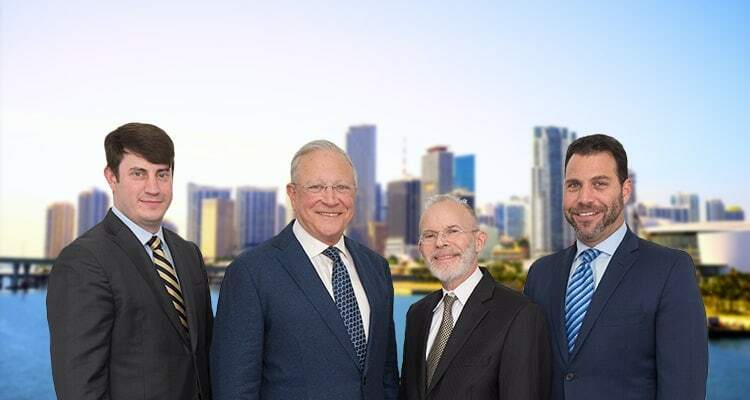 At Gerson & Schwartz, P.A., our experienced Miami construction accident attorneys have decades of experienced helping injured workers recover compensation for their injuries. If you or a loved one was injured after a fall from a construction site, schedule a free consultation with our office today. We can review your case at no cost to you, and help you determine if you have cause to file a third-party injury lawsuit. To schedule your appointment, call (877) 475-2905.